Need more information about booking Home 15186 ? For more details see House near Mickey website. Luxury spacious private villa with own pool situated on a lovely, well maintained gated community, ideally situated for Walt Disney World. It is only 30 mins from Universal Studios and Sea World). Should you wish to visit the coast, you are approx 1 hour from either coast. It is close to a supermarket and other shops, as well as having several golf courses within a 10 minute drive. Its own electrically heated, kidney shaped swimming pool with extended pool deck faces west, and with open aspect at the rear affords a great view of the lovely Floridian sunset.The community has it's own clubhouse which has a communal pool, a gym, reading room and wi-fi internet access (all of which are free for our guests). No Indoor smoking but smokers are welcome to smoke out by the pool. Our property is primarily our holiday home, and as such is better equipped than the average rental home. The villa is spacious and it's cathedral ceilings ensures that it is light and airy. It is air conditioned throughout. There are two lounges one of which has cable television (with over 100 channels including British Football) and DVD/BluRay player, and there is a second television and DVD player in the Master Bedroom. Free high speed WiFi is available throughout the property and on the pool deck. There is a table tennis table provided in the garage for your enjoyment. The first master bedroom enjoys direct pool access via patio doors, and has it's own bathroom with shower, double heart shaped bath and separate WC. There is also a walk in closet off the bathroom. The second master is again en suite with shower and bath facilities. The third bedroom has an American Bunk (3/4 bed underneath, single on top) and the fourth bedroom has twin beds. The kitchen is well equipped with hob, oven, grill, microwave, dishwasher, fridge freezer with ice maker and a good range of cooking utensils. There is a 'formal' dining room, but also an 'informal' area for eating with a table and breakfast bar. We offer highchair and cot facilities at no extra cost. The price quoted is inclusive of all Florida state and local taxes, utilities, cable TV and free local phone calls. We provide all bed linen and towels. The only extra charge is pool heat, which is optional, and costs £70 per week.Our management company is small and local which ensures that you get a personal service. They will provide a welcome pack if you so wish and are available 24 hours per day in the event of an emergency. 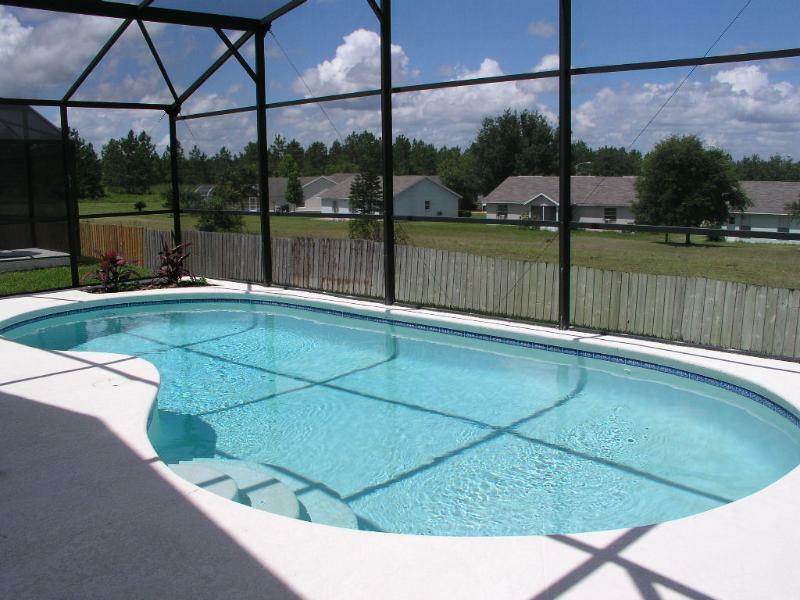 The property has it's own kidney shaped swimming pool which is electrically heated. The pool deck faces west so it is great for sun lovers and gives a super view of the fabulous Floridian sunsets. An outdoor dining table and chairs is provided and an extra table and chairs is available for bigger parties. Four loungers provide comfortable sunbathing and beach towels are supplied for your convenience. There is a larger communal swimming pool on the estate, together with a gym and library. These are all free of charge for our guests. Response from the owner Thanks for your great comments - come back soon! We booked this property based on previous reviews and it definitely didn’t disappoint. It is extremely clean, spacious & has everything you could possibly need for your stay. They have really thought of everything including a wide selection of games for rainy days, a fully equipped kitchen & little extras such as beach towels & ponchos. The pool area is well equipped & private. From the initial booking through to our stay nothing was too much trouble with comprehensive information provided for travel to the villa & useful guidelines for during the stay. It was well located being close to parks & shopping. Any minor issues we encountered e.g. a problem with the tumble dryer, were rectified in a few hours. This was our first time staying in a villa but thankfully we hit it lucky & can’t wait to plan a return visit to this villa. Many thanks to Yvonne & Grisel for all your assistance. We look forward to returning. Response from the owner Thankyou for your fantastic review Una. We do try hard to give you the perfect holiday and I'm glad that we succeeded. Come back soon! The first thing that struck us when we arrived at the property was just how big it is. Much bigger than it seemed from the photos. Over the next 2 weeks we found out how well located it is to everything that a family wants to do/visit in Orlando too. Yvonne has been extremely helpful throughout the booking and holiday process with very fast responses to any questions we had throughout. Yvonne also provides a very comprehensive pack a couple of weeks before you depart for your holiday including detailed directions to the property as well as helpful hints and tips for whilst you are there. The property itself has lots of additional facilities such as DVDs, table tennis table, inflatables for the pool, cool box, towels for the water parks etc. We had a great time. Response from the owner Thankyou for a great review - come back soon! Great villa in a very secure location. Masses of space inside so with kids about, you didn't feel you were tripping over each other. Great pool attached which was well utilised over the 2 wks. A home away from home. Would definitely go back and without hesitation recommend it to others. Response from the owner Thanks Jacqui - Glad you had a great time - come back and see us soon! our second time staying at the villa and its the best place ever!! will definitely return with no doubt! Had a great 2 weeks in this lovely villa, it is well equipped with everything that you may need while on holiday including free Wi-Fi which is a bonus. The villa is spacious and very welcoming, the sofas & beds are all extremely comfortable, there is a myriad of information and leaflets for things to do and see and places to eat while staying here. The location in Westridge is very quiet and friendly and is easily accessed off Hyw 27 there is a Publix supermarket, petrol station, pizza etc within a short drive. The owner was very helpful and a pleasure to deal with throughout, my security bond was returned very promptly. Thanks Yvonne for letting us stay. Response from the owner Thanks William - glad you had a good time - hope you will use us again in the future. A small group of us stayed in August 2015 for 10 days. The gated villa is located close to Disney (about 20 minutes) which is perfect! The estate is quiet and secure, with a driveway for the car. The villa itself has all the amenities you need - cooker, fridge, freezer, dishwasher, wi-fi etc. There are 3 bathrooms which was great as each couple and the little boy had one each, perfect if you ask me! I thought the price was really really good and I'd highly recommend staying here, you won't get better for your buck. Very good communication and information from the owners prior to travelling. Directions from the airport were clear. Arrived in the early hours of the morning and it was reassuring that the porch light was on, as were the lamps inside, ready to welcome us. The villa is located on Highway 27 within a safe, gated community. Many amenities are only a short drive away - a large Walmart and various restaurants. It's also an easy, straight-forward, 30 minute drive to the Disney theme parks. The villa was equipped with everything we could possibly need for a comfortable, homely stay. My son was particularly impressed with the number of towels! And it was great to have the pool to swim in on the days that we were taking a break from dashing round the theme parks. I would highly recommend this villa and will definitely book to stay there again on our next visit to Orlando. We returned to this house following a visit last year. Everything you need is provided and there is plenty of space with 4 bedrooms and 3 showers/toilets. It is always lovely to return to the house after a hot day in the theme parks and cool down in the swimming pool.